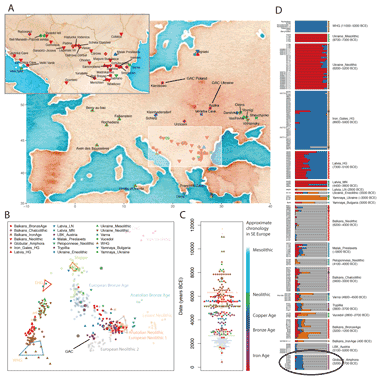 A new paper at PLoS ONE featuring ancient mitochondrial (mtDNA) data from Wielbark, Przeworsk and early Slavic remains argues for matrilineal continuity in present-day Poland since the Iron Age. It's actually based on a thesis that I blogged about more than two years ago (see here). However, it does include some fresh insights, so it's worth a look even if you read the thesis. RoIA stands for Roman Iron Age. 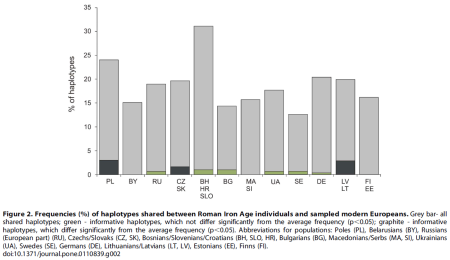 Three modern populations or groups of populations (Lithuanians and Latvians, Poles, and Czechs and Slovaks) were found to contain significantly higher percentages (p,0.05) of shared informative haplotypes with the RoIA samples compared to other present-day populations (Figure 2, Table S4). Notably, modern Poles shared the highest number (nine) of informative mtDNA haplotypes with the RoIA individuals. Of particular interest are three RoIA samples assigned to subhaplogroup H5a1, which were recovered from the Kowalewko (sample K1), the Gaski, and the Rogowo (samples G1 and R3) burial sites (see Figure 1). Recent studies on mtDNA hg H5 have revealed that phylogenetically older subbranches, H5a3, H5a4 and H5e, are observed primarily in modern populations from southern Europe, while the younger ones, including H5a1 that was found among RoIA individuals in our study, date to around 4.000 years ago (kya) and are found predominantly among Slavic populations of Central and East Europe, including contemporary Poles . Notably, we also found one ME sample belonging to subhaplogroup H5a1 (sample OL1 in Table 3). The presence of subclusters of H5a1 in four ancient samples belonging to both the RoIA and the ME periods, and in contemporary Poles, indicates the genetic continuity of this maternal lineage in the territory of modern-day Poland from at least Roman Iron Age i.e., 2 kya. The evolutionary age of H5 sub-branches (,4 kya)  also approximates the age of N1a1a2 subclade found in the RoIA population (sample KA2) (Table 2). The coalescence age of N1a1a2 is around 3.4–4 kya, making this haplotype one of the youngest sub-branches within hg N . The N1a1a2 haplotype found in one RoIA individual was classified as unique because no exact match was found among the twelve comparative populations or groups of populations used in the haplotype sharing test. Notably, a similar N1a1a2 haplotype carrying an additional transition at position 16172 was found in a modern-day Polish individual . I suspect the publication of these results at this time, so many months after they were first revealed in the aforementioned thesis, is part of an effort to drum up interest and secure funding for a new project on the genetic history of Greater Poland, which was announced late last year (see here). I say that because one of the people organizing the project, Janusz Piontek, is also listed as a co-author on this paper. So if we're lucky we might soon see full genome sequences from a few of these Iron Age and Medieval samples. Which Specific SNP mutation of R1a1a clade do you belong to? Z282, M458? Any age of that mutation that you have found for your Blood Line? Z280 is most likely a Corded Ware marker when found in Central (or East Central) Europe. Is This Marker Found Outside Europe Like In Near East and Central Asia? Yes, at low frequencies close to Europe. Thanks! BTW how is the distribution of R1a-Z93+ clades in Europe? Scarce?.. Yes, scarce, but many look very basal and old. Which population In Europe Show the highest Frequency of those basal and old Z93 Clades? Nir, why do you call Indo Europeans Aryans? That makes me suspicious you're thinking in terms of South Asian vs European race fighting on who are most like the original Indo Europeans. I'm not saying you're biasedly picking one side or the other but I think you're letting it cloud your reasoning. It shouldn't be made into this controversy. What opens peoples mouths should not be race-controversy put into ancient history, but real ancient history. I've gotten the fibe that the many south-central Asians and west Asians on genetic blogs are fed up with everything being about Europe. Almost all the discussions, ancient DNA studies, etc. are about Europeans with some insight into other west Eurasians as a side effect(UHG, Basal Eurasian). As a result I think you're miss interpreting what people such as Davidski say the wrong way. No one being Eurocentric in their conclusions and trying to put South Asians on the bad end of the story. Davidski simply thinks R1a-Z93 originated in Europe, not because he wants to make Europeans superiors to south Asians. The Yamna-proto Indo Europeans can't pass in any major genetic-clusters around today and who they were is not centered on one ethnic group or another(like ethnocentrics believe). They were who they were, and people are trying to discovery who they were. I would bet my life that they didn't view themselves as some-type of Aryan race with in-born superiority over other races and destined to rule their inferiors. ''...even by laymen people it can be found that the Aryan Culture and its roots which can be traced by the archaeological cultures of the concerned areas (like in the case of Europe With CWC and other related cultures) are far older than 2000 B.C'' I was just pointing out that the Presence of Aryan Culture and its roots are far older than 2000 B.C. In Central Asia and SC Asia which can be proven by Archaeological analysis (Other kinds analysis also, See the first link which is on Indo-Iranians ) the same way in case of Europe where the presence of Indo-Europeans can be proven by studying CWC Etc related Cultures!. I know but his proposal of Indo-Iranian migration to Central and SC Asia is wrong. So basically the local's today are the local's of yesterday not some foreign invader? If that is the case the Mass Migration Period is most likely a myth and the ancient text's we have are less useful than a foot stool. Thanks for the link Alex!, and if you want a serious deep scientific discussion on Aryans and related Indo-European issues you just have to visit the great website i linked above!. So in other words, the migration period saw a bit of movement around Europe, but it didn't have nearly the same impact as the Neolithic transition and then the Indo-European expansions. Have you had any contact with the authors of this study? Specifically about the possibility of Y-DNA coming up in the near future? I am wondering about your thoughts on deeper ancestral origins of apparently rare Haplogroup H7 (inherited from Polish grandmother)?